As estimated in this report, the global distributed power generation market stood at US$ 57.36 billion in 2017. Witnessing a tremendous rise during the period from 2018 to 2023, the revenue in this market is expected to reach US$ 103.28 billion by the end of the forecast period. The main types available in this distributed power generation market are on grid and off grid. Among them, the demand for on grid is relatively higher and the trend is anticipated to remain so over the next few years, notes the research report. 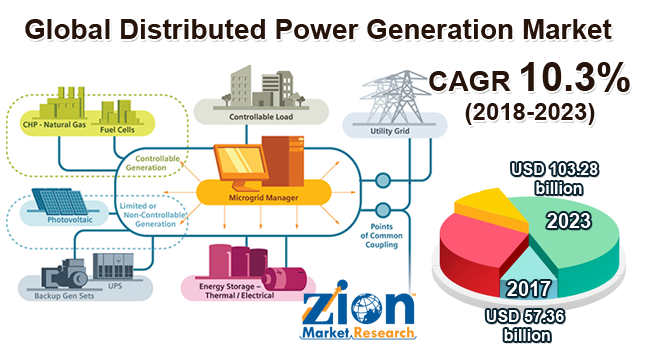 “Growing preference for decentralized power production along with deployment of transmission lines in giant power plants for generating power will favorably leverage distributed power generation market revenue in the near future,” says the author of this study. Apart from this, introduction of new technologies in the power utilities sector for distributed power generation is anticipated to boost the popularity of distributed power generation market in the years ahead.